In today’s episode of the Car Dealer Dirty Trick Free Zone I, Jill Merriam owner of Key Hyundai of Manchester and Key Hyundai of Milford, interview one of our salesman. At Key Hyundai we make customer satisfaction our priority. I make it my mission to be available to all our customers whenever they need to ask a question or have a concern. I belive that actually listening to customers and showing them that I and all the employees at both Key Hyundai of Manchester and Key Hyundai of Milford really do care, is our key to successfully serving our customers with the best experience we can. Mike, a sales professional, at Key Hyundai of Manchester let me take this video of him. Mike has been with us for awhile now and is the proud new father of twin boys and he also has a daughter. We feel so lucky to have Mike here because he truly cares about each and every one of his customers and it shows. All the time I receive emails and letters from customers praising Mike for the outstanding job he did when they purchased their car. I thought it would be important to write this post so that I can show my appreciation for all the hardwork everyone puts in and to show that there are car dealers out there who do actually care and have your best interest in mind. So thank you everyone, employees and customers and thank you Mike! As always, if you have any questions please feel free to email me directly at jillcares@keycars.com or you can visit my website at http://jillforthepeople.com. In today’s episode of the Car Dealer Dirty Trick Free Zone I, Jill Merriam owner of Key Hyundai of Manchester and Key Hyundai of Milford,talk about a scary statistic facing the car dealer industry. In a recent poll I was reading about, it said that 93% of those polled hate the car buying process. WOW! That is a really, really high number. I am a firm believer that the car buying process should be fun and joyful. A car is one of the bigger purchases you make during your life and why does it have to be this long and dreadful process. Well to me it dosen’t. I am determined to turn that statistic around. To make this process and experience more fun for you, I thought I could share some tips to make it a bit more enjoyable. My first tip is to know your credit. Know it inside and out and understand it better then the dealer does. My second tip is to do research online. With so much information now available online, the car buying process is really in control of the consumer, so look around online. My third tip is to try and do all your test driving in one day. It is easier to compare when you have a fresh memory of what one car had that another didn’t and it can save you time from having to do it all over. If you follow these tips, you should see that car buying can be fun and a great experience. If you ever come across something you don’t understand about car buying or need advice please email me directly at jillcares@keycars.com no matter where you are. My name is Jill Merriam, owner of Key Hyundai of Manchester and Key Hyundai of Milford, you can visit us on the web at http://keycars.com. In today’s episode of the Car Dealer Dirty Trick Free Zone I, Jill Merriam- owner of Key Hyundai of Manchester and Key Hyundai of Milford, talks about the biggest car dealer myth. Being around the car dealer industry for most of my life, I have heard every myth, story and assumption that their is about dealers. Suprisingly these myths are one of the biggest reasons I got involved and ended up having two dealerships in Connecticut. I always thought about how different car buying could be if customers actually enjoyed their experience at a dealership and left feeling like they got the best deal on the car they really wanted. I decided I should take these myths and demistify them and create exactly what I thought the best dealership experience should be. I created a Car Buyer’s Bill of Rights and I dedicate myself to being a solution provider and offer the best advice I can to customers, friends, family and anyone who has questions about car buying. I take this issue of turning the car business into one with a positive reputation seriously and work at it one day at a time. If you have any questions about car buying no matter where you live, I would love to be able to share my knowledge and share helpful advice so please email me directly at jillcares@keycars.com. My name is Jill Merriam, owner of Key Hyundai of Manchester and Key Hyundai of Milford, and I am the dealer for the people. In today’s episode of the Car Dealer Dirty Trick Free Zone, Jill Merriam visits Key Hyundai of Manchester’s parts department. At both Key Hyundai of Manchester and Key Hyundai of Milford we have parts departments where experts in accessories and car parts work and are available at anytime to answer questions. Jill thought it was important to share this becuase there are so many accessories out there for cars. Jill wanted to visit the parts department to find out what some of the most popular accessories that we have in stock are. John, who works in the parts department in Key Hyundai of Manchester, informed Jill that IPod cables are usually very popular. This cable allows you to plug your IPod in to your car and control it right through your stereo, of course this is only in cars that come with the capability. If you would like to know more about what kind of accessories can be purchased to use in your car feel free to email me directly at jillcares@keycars.com. You can also visit our service and parts department on the web at http://keycars.com/. My name is Jill Merriam, owner of Key Hyundai of Manchester and Key Hyundai of Milford, and I am the dealer for the people. I got this email from one of our happy customers today. It literally made my day! They have bought four Hyundais from us at Key Hyundai in Manchester, CT. A huge shout out to Kathy for taking the time out of her incredibly busy day to email me. Dear Jill, Thanks for being so great. My parents love you! Actually my step-father, Craig Szwed, was in there yesterday for an oil change and he called me just because he thought of me. He really said, “I’m sitting in your favorite dealership waiting for my oil change service and thought I give you a call” How funny is that! Whether he likes it or not he will think of me every time he gets his oil changed. You know every month I am in there for an oil change and I can relate to my step-father. Every time I walk in I am reminded of all the great experiences I have had there. From buying my first Elantra in 2008 to the, winning the flat screen TV at the new owners party in 2008, to the caring, helpfulness of the staff when I walked in after having my car accident and then to buying my new 2010 Tucson. In two years I have so many fond memories that will stay with me forever, and the memories are not of what happened but of how your staff made me feel. I work in a Pharmacy were customer service is key. (no pun intended) Every day I speak to many ill people. They don’t feel good and who knows if or when they will ever feel good, but the point is that no matter what mood the customer is in, they just want to be taken care of with a smile and feel like they are cared for. “The customer my not remember what was said, but they will always remember they way they felt when it was said.” You have trained your staff well. I always feel like I’m someone important and that makes me feel good. Thank you! 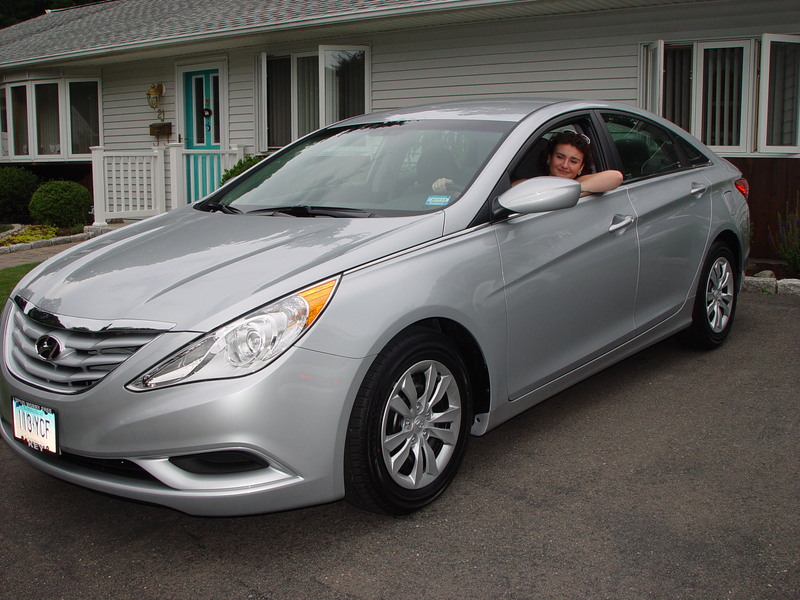 For more stories about Key Hyundai’s happy customers, check out http://www.hyundaictdealer.com/customer-testimonials.aspx or visit us at Key Hyundai, 21 Hartford Tpke, Vernon, CT. We are located on Rt. 83 between Golf Land and Kohls. Jill attributes this to have an amazing husband. He is a stay at home dad who put his career on hold so Jill could open the two dealerships. He is a great guy who gives all of his attention and care to their two kids. Many people think that Jill and Rob must have known eachother for years but the reality is that they didn’t know eachother for years. They met back in 1999 while both watching game three of the red sox and yankees playoff series in Boston when they both happended to be in the same place. They were standing next to eachother and they found they had so much in common. Jill feels so lucky to have met him and is so greatful for everything that Rob does. If you every have any questions about buying a car, no matter where you are, please feel free to email Jill directly at jillcares@keycars.com or visit Jill at http://jillforthepeople.com. In today’s episode of the Car Dealer Dirty Trick Free Zone, I talk about strengths and weaknesses. I read a book that recently changed the way I live my everyday life and the message of this book was that your strengths ultimately become your weakness. I get asked a lot what has allowed me to succeed in my life. I have an incredible drive and a lot of determination. I realize that sometimes I may not be the best at something but I do have a desire to work things out and see them through to the end. This determination can also be my weakness because it can get stressful sometimes and my mind never stops. My name is Jill Merriam, owner of Key Hyundai of Milford and Key Hyundai of Manchester and I am the dealer for the people. You can visit me on the web at http://jillforthepeople.com or http://keycars.com. The down and dirty reality about owning a car dealership nowadays is that not every customer is easy to deal with and not every customer is very nice. I’m sure that all the marketing gurus would be furious if they knew I was posting this on my dealership’s blog, but it’s the truth. That being said, it’s really only a very small percentage of the people who don’t play nice with others and the majority of our customers at Key Hyundai of Milford are incredible super people. My day yesterday was a tale of two cities. I had a very difficult customer followed up by an amazing email from a happy, delightful customer. I guess you can call that karma. Anyways, here’s what happened. I was sitting at my desk on the showroom floor at our Milford Hyundai location (yes, as the owner I sit on the showroom floor) when a customer came loudly walking into the showroom from service looking for me. He immediately starting screaming at me. Okay, you’re thinking right now, “I’m sure he had reason to scream at you.” So, his reason for screaming at me was that we called him to confirm his service appointment and he felt it was insulting to his intelligence. He wanted to know if we thought he wasn’t smart enough to remember his appointment. Then, he told me that I am a bad, horrible person because I make our service advisors recommend changing the air filter in his Hyundai at 15,000 miles when all the car really needs is an oil change. I literally couldn’t get a word in edgewise. So, I sat there quietly and took it from him. He then proceeded to walk away and come back yelling at me three more times about the same issues. So, we put two technicians to work on his oil change and got him on his way as soon as possible. I even gave him his oil change for free. Once he knew it was free, he apologized to me and told me that he had a bad morning before he got to us. He shook my hand and wanted to know if we were now friends. He then said, “I’m French and we’re not nice people.” I got a chuckle out of that because all my French friends are delightful. I’m not sure you can blame his ranting and his rage on an entire nation. It took me about an hour to recover from that one. Then, I got an email from an amazingly happy customer from Key Hyundai in Manchester. Rather than try to recreate what she said, I am including the entire email. If Kathleen ever gets a change to read this I want to make sure she knows she made my day! She even attached the following pictures. Thank you for the Purple Pear Buttered Almond Cream topping sent recently to thank me for my recent car purchase. That was very “sweet” of you. I wanted to take time to tell you about my recent Key Hyundai experience. My daughter and I show dogs. In 2004, I purchased a 2002 used Santa Fe from Key Hyundai to accommodate the travel needs of our hobby. I have had it serviced throughout the years at your dealership. It now has 142,000 miles on it and runs like the day I drove it off the lot. I built a bit of a friendly relationship with one of mechanics that works on my vehicle frequently. When I drop it off for check-up service before a long trip, if he is working, he is always so interested to know where we are heading for our show week outing, even at times, offering alternative route advice to avoid traffic nightmares. I have always had such positive experiences with service and know my auto is “good to go” when I pick up. Over the last month, I have been in dilemma with what to do about the fact that my 16 year old will be licensed in just a short few more weeks. I toyed with the idea of getting her a smaller car to take her back and forth to work and school but really felt that she was too young for a “new” car although, her safety and my peace of mind balanced on a dependable vehicle for her to be out on the road with. Two weeks ago, I brought my auto in for service and was taken care of, with kit gloves as usual, within one day. After drop off the night before service, I walked the new car lot and fell in looooove with the 2011 Sonata. Having several friends that own that model, dating back as far as 2002, I knew I wouldn’t be wrong glancing at this auto for whatever the possibility be. The Sonata’s new look has such “curb appeal”, really is beauty on wheels, but ???…. After not too long of thinking, my husband and I made a decision to turn over the Santa Fe to my daughter when she is licensed and that I would get the “new wheels”. All I have to say Jill is that since I picked it up last Saturday I have been smiling “ear to ear”. The purchase experience thanks to Ed Poland was effortless. Jesus is the best and your finance person (can’t recall his name, sorry) made the signing as smooth as “butter on a hot frying pan”. S o o o e a s y. Sort of laughed to myself after all was said and done thinking I should buy them all Easy buttons from Staples to put on their desks. Knowing my daughter was going to be the recipient of the Santa Fe, while in service, Ed had it bathed, polished and vacuumed for me to soon present to her. Man Jill, so way up above and beyond even my wildest of dreams. Kudos to all involved. I will continue my loyalty to Key Hyundai because of yours for us. I can only hope that as my daughter ages and it comes times for her to trade in the Santa Fe, she too will come to you for her purchase. Keep up the positive that you share. Wishing much success to you and Key. I will be spreading my news about my experience if not through my smile alone. I do and my daughter surely will be “driving worry free with Key”. PS These pics are the smiles my daughter wears knowing how thrilled I am with my new set of wheels. Enjoy and thanks again. OK to share this email with all. In today’s episode of the Car Dealer Dirty Trick Free Zone I talk about negative equity. Negative equity is one of the top situations that car buyers get themselves into. Negative equity happens when you owe more on your car than it is worth. Unless your car is some sort of collectors car then it is a depreciating asset. Every mile that you drive your car, it becomes worth less and less money as you go along. Negative equity can occurr if the length of the loan on your car is longer then the amount of time you own it. There are ways to avoid getting into this situation. The first way is to try to take out the loan for the amount of time you think you will own the car. The second way is to put more money down on the car and the third way is to check with the dealer to see if there is a big rebate on the car. This rebate helps reduce the loan amount and can keep you out of a negative equity situation. If you need help anytime, no matter where you live, analyzing the car loan you are in please send me an email at jillcares@keycars.com. You can also find information about car loans on our site. In today’s episode of the Car Dealer Dirty Trick Free Zone I talk about my first job. I think it is so much fun to think back to your first job and how many lessons you probably learned. My first job was at a state park in Connecticut and I had two different jobs there. My first job was being the manager of the food stand and my other job was to scoop Italian Ice on the boardwalk. Both of these jobs were hard, exahusting work. My first job taught me the necessity of working hard. I learned that if you work hard you can really accomplish something. My first job also taught me the importance of having a plan in your life. I learned that it was important to sit down and take some time to plan where I wanted to work in the future and the direction I wanted to go in with my life. Think back to your first job. What did you learn and did you take that with you through to today? I hope to constantly keep learning and be taught new lessons in my career today as owner of Key Hyundai of Manchester and Key Hyundai of Milford. My name is Jill Merriam and I am the dealer for the people.